It’s 35 degrees outside but high in an RMIT University tower in Swanston Street the air is chilled to just 19 – brain temperature. Around the room, nine people sit bent over their desks. Most wear noise-cancelling headphones. No one speaks. This is the second day of the 2015 Australian Memory Championships and it’s crunch time. In one final lightning round, the top memorisers in the country are going head to head for the tournament title – including students Rory-Clay Edwards and Aviv Dolan of Upwey High School. They’re nervous, both newcomers to the world of memory sports, but already the pair have broken three national records between them. 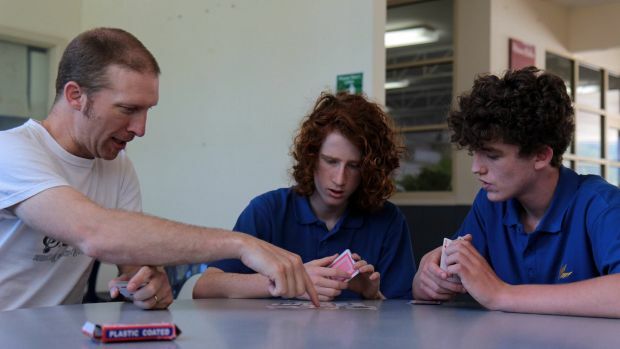 A few desks away sits their teacher, Dan Mayes, another first-time competitor and head of Upwey High’s “Memory Club”. By the day’s end, he will have placed third overall in Australia – after memorising the order of a shuffled deck of cards in less than three minutes. While Mayes and his students are quick to assure they are not blessed with extraordinary abilities – no photographic memories, genius IQs or superpowers to report – they do share a secret. It was the same secret known by Aristotle in Ancient Greece and by Thomas Aquinas in the Middle Ages: a 2500-year-old system known as mnemonics, or the art of memory, which encodes information into the memory using visual imagery. Today, it has survived almost exclusively as the sport of “memory athletes” but, thanks to Mayes, both Edwards and Dolan are among the first people to learn mnemonics in an Australian classroom. And now, with a world-first trial of the techniques being carried out in schools this year by tournament host and former silver medallist Daniel Kilov, they won’t be the last. For Kilov, it began in August with teachers’ boot camp – the memory athlete was flown to Darwin to train nine handpicked educators at the invitation of occupational therapist Greg Wills. After more than 30 years working in Australian classrooms, it had been the sight of a little girl racing off to her principal’s office in excitement that convinced Wills it was time for a revolution in education. The girl had fetal alcohol syndrome yet, using Kilov’s techniques, she had just memorised 10 words for the first time. In consultation with Kilov, Wills is co-ordinating four research projects in mnemonics across four schools in the Northern Territory. Kilov says science shows the best learning methods are “visual, colourful and diverse”, yet students are taught with repetitive, black-and-white note-taking. And this disconnect marred Kilov’s own path through school. Ten years ago, the 27-year-old PhD candidate could barely remember to bring his books to class. But, in 2011, Australian memory champion Tansel Ali took Kilov under his wing for intensive mnemonic training. Within six weeks, Kilov was competing by his side at the Australian Memory Championships. Having funded his own successful schools program in 2014, the School Mind Games, Ali shares Kilov’s passion for “disrupting” traditional education models. By contrast, he says, mnemonics play to the brain’s strengths. Hard-to-remember information such as numbers and names can be converted into visual or spatial memories – things the brain loves to learn – by making up stories and images to go along with them. “It’s fun,” says Monash University student Sophie Tversky. She’s just finished explaining how she remembered the name of a particular criminal case by imagining a giant chicken schnitzel holding a knife in her kitchen. Two years ago, Tversky trained for a month under Kilov and last year she saw her hard work pay off – sitting a gruelling open-book law exam closed book. While Kilov and Ali are adamant anyone can learn mnemonic techniques – from law students to children with intellectual disabilities – Professor John Sutton, the world expert on the philosophy of memory at Macquarie University, is not convinced. At Upwey High, Mayes, a former psychology teacher, is still regularly contacted by former students benefiting from their early memory training. But he agrees that mastering the techniques is often up to the individual. Now in year 10, Edwards and Dolan spent two semesters in “Memory Club” last year, intensifying their training before the November championship. “I think I have a better memory just in general from practising it,” Edwards says. At Munich University in Germany, memory champion and neuroscientist Dr Boris Konrad is one of the few people in the world to have put his techniques through rigorous empirical testing. He recently compared levels of improvement in memory training between those of high intelligence and those of average intelligence. Early feedback from Kilov’s Art of Memory Schools program is equally encouraging. One teacher at a Darwin primary school reported remarkable improvement in two students with “extreme emotional problems”, writing: “It’s a bit like therapy for them and also they’re learning.” Another two students moved up two reading levels after just one month. Still, Wills knows better than anyone how hard it can be to get teachers “on board with new ideas”. Over in Germany, Konrad is now studying the effectiveness of mnemonic learning aids on university students. His results should line up with those from the Northern Territory program – where student post-testing is due back by the end of first term this year. But, according to Sutton, the biggest spark in the mix might just be Kilov himself. ABC Darwin on the AoM Schools project. Here is an interview with ABC Darwin about my recent trip to the Northern Territory, the techniques of the Art of Memory and the AoM Schools pilot project. Enjoy!